Want new ideas for increasing your book’s sales? 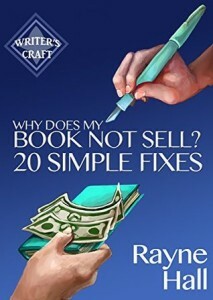 Check out Rayne Hall’s Why Does My Book Not Sell? for quick advice on selling your book. At some point after you’ve written and published your book, you may find yourself asking why your book isn’t selling as well as you had hoped. Have no fear: Rayne Hall’s guide to selling your Book is here! Hall’s guide is incredibly practical: the book is divided into 20 discrete areas where your book or marketing plan may be lacking, such as your book cover or targeted audience. Each section provides specific ways that you can improve in the area: for book covers, try an asymmetrical design, and for marketing, think about more specifically defining who your audience is likely to be. What I took away most from this book was the need for targeted marketing. Instead of trying to market my book to all readers everywhere, I found it helpful to take a moment to really describe my target audience: what kind of books they read, how they tend to use the Internet, and where I might find them. This is turn helps me devote more time to developing marketing strategies that are more likely to reach my target audience instead of a broad strategy that might not appeal to readers of my specific niche. Why Does My Book Not Sell? is probably most helpful for the indie author who already has some footing in their publishing career but in need of further suggestions for ways to sell their book. This guide may also be helpful for the writer who has not yet published but is thinking ahead and already working on a book marketing plan. Rayne Hall’s book is available on Amazon for 99 cents or for rental with a Kindle Unlimited subscription. Have a resource that has helped your writing career? Leave a comment below!